My head starts to itch when I even write about lice. Lice are a common problem wherever children gather. If you are concerned about lice, you are not alone. Each year, many day-care centers, schools, neighborhoods, extended families, and small family units face this problem. Adult lice (also called Pediculus humanus capitis) are six-legged, wingless insects 2-4 mm long. They have translucent grayish-white bodies, and look a bit like a grain of rice with six legs. Their heads have two tiny eyes (too small to be seen without magnification) and two small antennae (usually visible). Six pairs of hooks that surround the mouth allow them to attach themselves to the skin of the scalp for feeding. The mouth contains two retractable, needle-like tubes that pierce the scalp. Salivary juices are injected into the scalp to prevent blood from clotting, and then the lice feed happily, sucking blood through these same tubes. Their translucent bodies turn reddish brown when engorged with blood. Lice completely depend on the blood extracted from humans for existence, and thus will starve to death after 55 hours without blood. Lice eggs are called nits. These white, translucent, pinpoint-sized eggs are laid near the base of hair shafts, and move outward as the hair grows (nits found near the tips of long hairs suggest a longstanding infestation). Nits are glued tightly to the side of the hair shafts, and cannot be moved along the shafts or knocked off with fingers. The eggs hatch between ten to fourteen days after they are laid. The empty eggs remain attached to the hair shaft. The newborn larvae must feed on human blood within 24 hours, or they will starve to death. The larvae become sexually mature adult lice within about one week. Adult head lice can survive up to two days away from the scalp, which is how they are transmitted by things like combs, brushes, and hats. During this whole life cycle, larvae and adult lice deposit their feces in the scalp, which eventually causes itching as the person develops an allergic reaction to the lice stool. Lice seem to prefer children to adults, long hair to short hair, and they particularly like the hair of females. Interestingly, lice only rarely afflict African Americans living in North America. The lice in Africa and South America have adapted, however, and cases are common in every group on those continents. 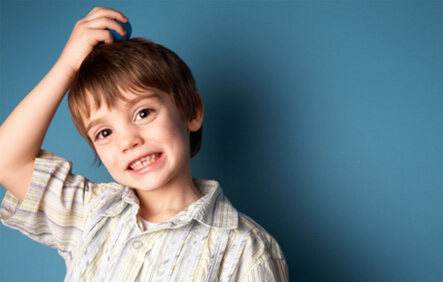 Cases of lice are most common in children 3 and 10 years old, but can occur at any age. Lice have been a nuisance to humans since ancient times. Having head lice is not a sign of poverty or poor hygiene. They have thrived almost wherever humans have been in prolonged close contact with each other. One notable exception to this has been in areas where the pesticide DDT is in widespread use. In the United States, for a period of about 30 years, lice outbreaks were uncommon. Since DDT was banned in 1973, the number of cases of lice has risen steadily. Today, there are about 12 million cases per year in the United States alone. The hallmark symptom of head lice is itching, but a person may have lice for months before the itching begins. Lice are quite contagious. They spread from person to person when heads touch. Because they can live independent of a person for up to 55 hours, they are also commonly spread via stuffed animals, hats, headphones, combs, brushes, towels, clothing, car seats, sofa cushions, and bedding. Each louse lives for about a month, but an infestation of lice will usually continue until treated. The best way to diagnose head lice is to inspect the head of anyone who might have been exposed to them using a bright light (full sun or the brightest lights in your home during daylight hours work well). A magnifying glass can make the job easier. Part the hair all the way down to the scalp in very small swaths, looking both for moving insects and nits. The entire head must be inspected to make sure there is no problem. Careful attention should be given to the nape of the neck and around the ears, the most common locations for nits. Even one nit in the hair should be treated. The egg might be empty, or contain a dead larva but then again, it might not! Frequently, people find “pseudo-nits” and panic unnecessarily. Bits of hair spray, dead skin scales, or loose debris may be seen on hair shafts. These move with pressure from the fingers, and nits do not. Also, live nits glow when exposed to a black light (we use black lights in pediatric offices for inspection) and dead nits and empty nits do not. Mechanical nit removal is the cornerstone of lice treatment, although medicines can be a real help. It is important for everyone potentially involved in an outbreak to be treated at the same time. If 99.99% of the lice are killed, but .01% are not, you already have the makings of another outbreak! Set a community-wide time to act — now! Print detailed instructions on how to get rid of lice and distribute them to children, parents, teachers, and anyone else who works at the school. Carefully comb through the hair using a nit comb. I don’t recommend using the combs that come packaged with lice shampoos. Instead, use a new product, called the LiceMeister. Its metal teeth are very close together, catching lice well, but without catching or pulling on hair. Since most children will only sit still for a short time (and since most parents don’t want to spend longer than necessary combing through lousy hair), using this comb results in a more thorough delousing than when using the ordinary plastic nit combs. Recent studies show that while white vinegar does loosen nits from the hair shaft, it does not kill adult lice and is probably not sufficient when used alone. Using stronger pesticides can set up a pattern of using more and more powerful pesticides as the lice develop ever-increasing resistance. This pattern has a definite negative long-term impact on the environment. It also exposes children to greater and greater levels of toxins. Most alternative treatments are untested, but early reports are promising. One method with widespread stories of success is the Vaseline (or mayonnaise) treatment. Cover the infested head liberally in Vaseline. Place a shower cap over the entire head for the night (or an eight-hour period). Then shampoo the Vaseline out of the hair. This treatment is reported to “smother” the lice. The downside of this method is that the Vaseline does not shampoo out of the hair easily — in fact, it usually takes a week or so to get it all out. The upside is that it is not toxic, and from all reports, it seems to work. Washing the hair with dishwashing liquid, which has a degreasing agent in it, may help. I’ve smothered my own hair in mayonnaise (loved the smell), and it came out easily with dishwashing liquid. Shampoo 3 tbsp olive oil. 1 tsp tea tree oil. 1 tsp rosemary or eucalyptus oil. One of our readers suggested using a hot blow-dryer for 15 minutes, morning and evening, in conjunction with thorough nit combing. The heat helps to kill the nits and adult lice, but the combing is essential to the process. This type of treatment should not be combined with the over-the-counter chemical treatments such as Rid and Nix since those chemicals are deactivated by the heat of the blow-dryer. . I’ve had great success combining the blow-dryer with an application of Cetaphil, though. You can read about that treatment here. As a last resort for extra resistant lice, the Red Book 2000 mentions two prescription medications creams — Lindane and Malathion. To me these cures are worse than the disease — both for those being treated and for the environment. In fact, these creams are thought to be so dangerous in our water supply that the state of California banned the use of lindane to treat lice or scabies. Whatever treatment you choose, removing lice from the environment is critical to breaking the cycle. After the head is treated, wear a tight-fitting shower cap or bathing cap to prevent re-infestation during the cleaning process. Every surface in your home and car(s) that has touched a head, or has touched an object that has touched a head, must be deloused! All clothes need to be washed in hot water and dried in a hot drier. Even clean clothes that have been hanging in a closet might need to be washed — if a person with lice wears a sweater, then takes it off and puts it back in the closet, any piece of fabric that it touches could become a new home for lice! Wash all bed clothing, including bedspreads, pillows, mattress covers — anything fabric. Dry-cleaning and ironing with a hot iron also kills lice and nits. Clothing and bed coverings that cannot be safely washed in hot water can be double bagged in black plastic bags, sealed tightly, and put away for three days. At the end of that time, wash the clothing according to normal washing instructions. Combs and brushes should be soaked in rubbing alcohol or Lysol for one hour, followed by washing in soapy water. Thoroughly vacuum all carpets — even under the beds! Steam cleaning is even better. Using a high-powered vacuum (not a battery-operated hand-held version), thoroughly vacuum all upholstered furniture. Or better yet, have all upholstered furniture professionally cleaned. Spray and powder forms of lice medicines can be used on carpets, floors, and upholstery. I personally prefer not to use these pesticides unless it is impossible to do a thorough cleaning. If you do need to use one of these products, be sure that your children are not present when you use it, and that you thoroughly air out the space before allowing your children to return. Before you take that lovely shower cap off, be sure to take off all the clothes you’ve been wearing during this process. Put on freshly hot-water laundered clothes, and put your work clothes in the wash. If you do not have access to a washer and dryer in your home, work in teams. Someone who has not been treated yet can put all the loads of laundry into the washers at a public laundry facility. Meanwhile, a second person can be treated, and then go to the laundry and take over. You want to avoid unlaundered clothes if you have been treated (unless you are wearing a shower or bathing cap), and you want to avoid handling clean clothes if you haven’t been treated. This great suggestion came from my friend Dr. Donnica, formerly of NBC’s Later Today show. Instead of cleaning every inch of the house, just lock your house up tight and go on vacation. Get rid of the lice on your heads, and then get out of town. I like this idea. Lice die after 55 hours without a human host. If you can afford to be gone for at least three days, you will return to a lice-free environment. If a child does not pass, have a plan. Parents cannot be allowed to just drop off their kids on that day. If the child doesn’t pass, the parent must have a provision for alternative child-care (this will be a real incentive to comply with the plan). In addition, have prepared instructions to give to any parents who may need to do all that work over again. Shampoo daily and follow with careful nit-combing. I like using tea tree oil shampoo for this purpose (this is not full-strength tea tree oil, but the shampoo that contains tea tree oil.) Found in health-food stores, this shampoo is reported to prevent re-infestation with lice, but studies have not been done to determine its efficacy. Repeat your original treatment choice in order to catch any lice that might have hatched since the first application. Do one last, thorough nit-combing. Continue scalp inspections until the lice have left the community — at least for the time being. Going back to school to face another year of lice must be very discouraging. Remember that you are part of a community. Blaming others doesn’t help anything; it is important for everyone to work together. By staying positive, the whole process can actually help bring a school together! I know my own children have fond memories of The Great Lice Adventure — now that it’s over!